As we close in on our moving date, I'm still filled with a mixture of excitement and mourning. I feel like I need to see and do everything I can in L.A., visit all my favorites places, eat at all my favorite restaurants. But I'm also researching and remembering all the great things to do and places to eat in St. Louis that are either old favorites: places I never went while growing up there; or places that have sprouted since I left. So, I thought it would be fun to both honor the past five years on the West Coast and however many years of my future in the Midwest with a little "Goodbye/Hello" series. And today the first thing that popped in my head was Italian food. 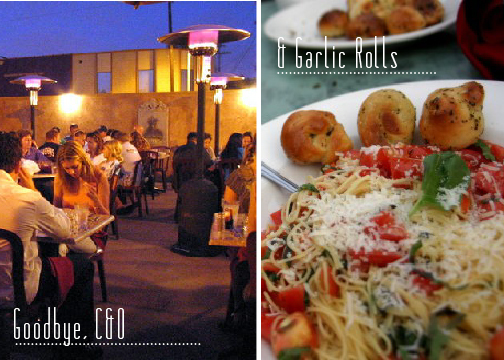 C&O Trattoria in Venice is absolutely my favorite Italian fare in L.A. The ambiance of the outdoor seating area, with its dim lights and space heaters, make you feel like you're sitting in a ristorante in Roma. The food, however, is Northern Italian, and since we didn't venture up there on our honeymoon, I can't compare; but I do know what you get at C&O is amazing. And see those glorious little garlic rolls on the right up there? Yeah...those things will get you good. They serve your table never-ending plates of them while you wait for your food. And by the time it arrives, you hardly have any room. If you linger until about 8/9 p.m., they have a nightly sing-a-long of "It's Amore!" where everyone in the restaurant sways their wine glasses to and fro and croons along with Dean Martin. The servers come by and click glasses with you, and it's just downright fun. As much as I love C&O, I can safely say it has nothing on St. Louis when it comes to Italian food. 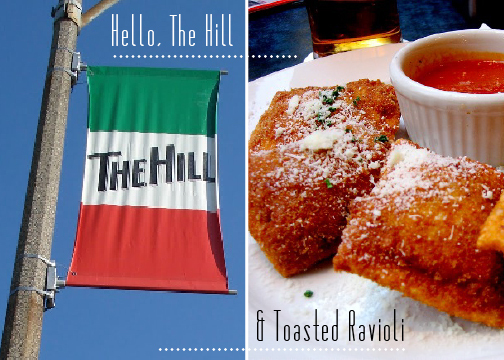 You see, South City has this magical land called The Hill, where a large number of Northern Italians and Sicilians immigrated in the late 19th century (baseballs great Yogi Berra and Joe Garagiola, Sr., grew up there!). And today, due mostly to the fact that houses in this area hardly ever go on the market, three-quarters of the residents are Italian-Americans. My husband and I paid a visit this past Christmas to get some food gifts for his family, and in each place we went the people who worked there were speaking Italian with their regular customers — it was like we were back on our honeymoon! And the food...well, I think we can safely say it's quite authentic. My parents took us here every now and again when we were growing up, and my great-grandparents used to own a store there (which is now a bank, I believe...boo). Favazza's, Zia's, Amighetti's & Rigazzi's are my favorites, but you really can't go wrong wherever you decide to eat. They also have the glorious Missouri Baking Company, where we'd oftentimes get goodies for special occasions. Perhaps what I'm most excited about, however, is being around proper toasted ravioli again! For those of you unfamiliar with this delish appetizer, it's breaded and fried ravioli served with marinara. You can't find it many places outside of St. Louis since that's where it's considered to have been created, so I've had to resign myself to making it at home while living in California. I've gotten pretty good at it, but it just doesn't compare to the ones made on The Hill. Okay...now I'm seriously hungry. :) Have any of you reading this ever been? What are you favorite places there?